While it’s always fun to break the mold when it comes to full color graphics; it is extra special when we can leverage our abilities to brighten someone’s day. With out a doubt, the best day to be brightened is for hospital patients. Pictured below is one of many custom “Art Cart” furniture wrap installations which we collaborated on with the Saint Luke’s Hospital network’s marketing and creative team. 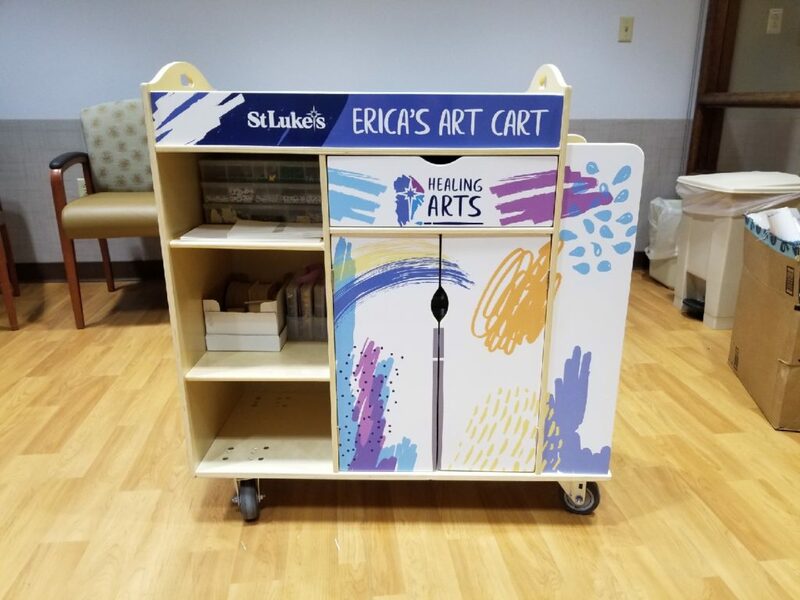 The purpose of the Art Carts is to provide a creative outlet for pediatric patients while under care at the various St Lukes campuses throughout Eastern PA. The fun design provides an air of fun activity in an environment where folks often need a means of cheering up. This isn’t the hospital’s first endeavor with a furniture wrap or architectural wrap. They’ve done many walls and other various surfaces to enhance the visual experience for patients and staff alike. The idea is to break away from the traditional sterile (plain) decor which many hospitals have been known for over the years. St Luke’s is producing these carts in the memory of Erica Curtis, who died at age 40, after a two year battle with cancer. As a patient at St Lukes, Erica found comfort in managing her cancer by fabricating pieces of jewelry with material from the Art Cart. We consider Saint Lukes to be a leader in the design innovation realm. This out of the box thinking is making their campuses a far more welcoming experience. They have been using our services, along with very modern architectural design to enhance the patient experience. No longer are full color and furniture wrap graphics being used by exclusively by retailers and amusement parks. Wrap graphics are everywhere.